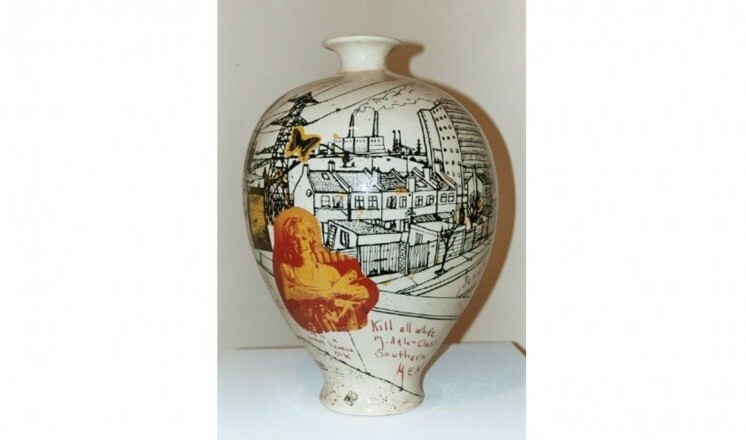 Grayson Perry is best known as a ceramicist. 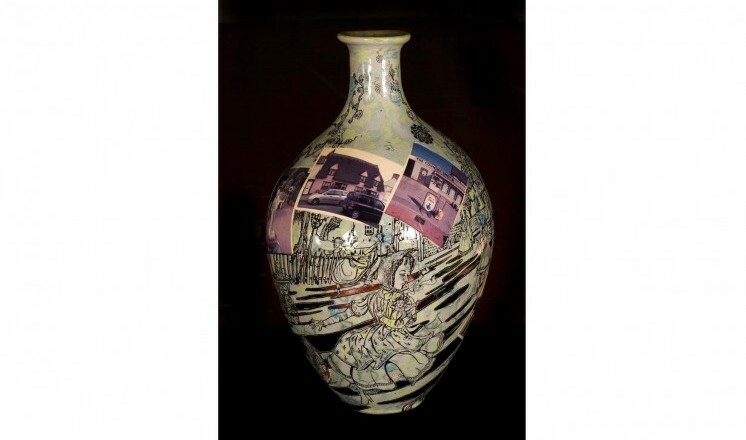 His vases, often with classical shaping, are decorated with patterns, text and images. They have a dark subject matter, revealing Perry’s insight into modern society. Sunset from a motorway flyover (2001) was the first piece the gallery purchased. Grayson was inspired to make it whilst walking through the landscape near his home in Walthamstow. On a winter’s afternoon in a bleak neighbourhood he came across some atrocious graffiti, which can be seen illustrated on the pot. 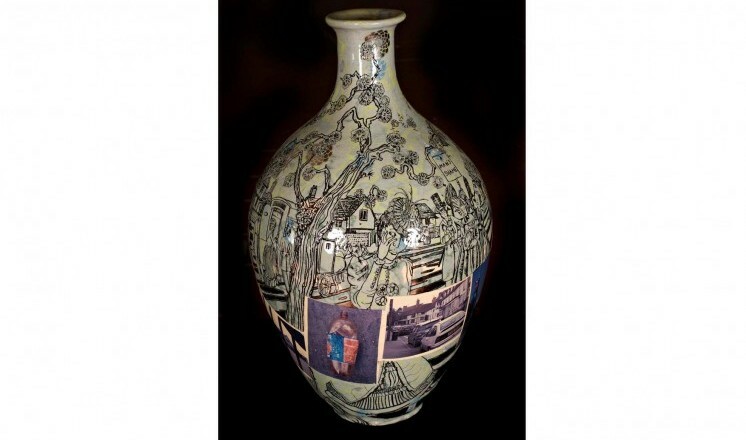 This purchase provided the gallery with an opportunity to develop a relationship with the artist, and through this relationship Grayson Perry was commissioned to curate an exhibition for The Collection. Grayson worked alongside museum curators for over two years developing the exhibition and it was during this period that he was awarded the Turner Prize. The exhibition The Charms of Lincolnshire was held at The Collection in 2006. The exhibition was a critical success. It allowed Grayson the possibility to think and create work about the countryside. It wasn't a historical exhibition about Lincolnshire, but focussed on the Victorian era and themes that had a strong emotional charge for him such as death, childhood, religion, folk art, hunting and the feminine. In acquiring Fantasy Village the gallery was able to illustrate the sequential involvement of the artist with the gallery. Both pots are inextricably linked. Grayson Perry's work improved and developed significantly since the gallery bought Sunset from a motorway flyover, and together with Fantasy Village the works show his development as an artist. The Charms of Lincolnshire went on to be shown at the Victoria Miro Gallery in London, and Grayson often appears on television and radio.